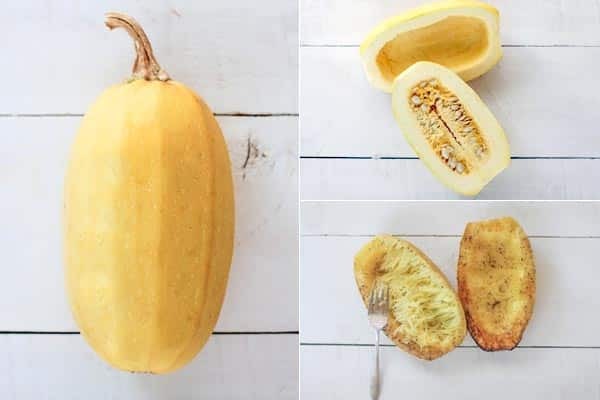 Spaghetti squash is one of the most versatile winter squashes you can buy. You can roast it and serve it shredded with your favorite sauce, you can stuff it with all sorts of glorious fall flavors, and the beautiful strings of squash make a pretty tasty salad. I have been known to purchase an extra large spaghetti squash and serve it up a few different ways in the same week without my family even catching on. Preheat the oven to 425°F. Cut the squash in half and scoop out the seeds. Drizzle the squash flesh with olive oil and season with salt and pepper. Place cut side down on a parchment-lined baking sheet. Roast until the squash is tender when pierced with a knife, about 45 minutes to 1 hour depending on the size of your squash. Recently I started playing around with turning spaghetti squash into fritters. There are so many different flavor combinations that would work in these savory little bites, but this Italian version is by far my favorite. This recipe calls for tender roasted strands of spaghetti squash combined with ricotta, parmesan, herbs and garlic. The batter is formed into small squash fritters and pan fried until golden brown and crisp. The outcome is a tender, fluffy fritter that has a slight crunch when you bite into it. The best part is that when you serve these up with marinara sauce they taste a lot like lasagna. 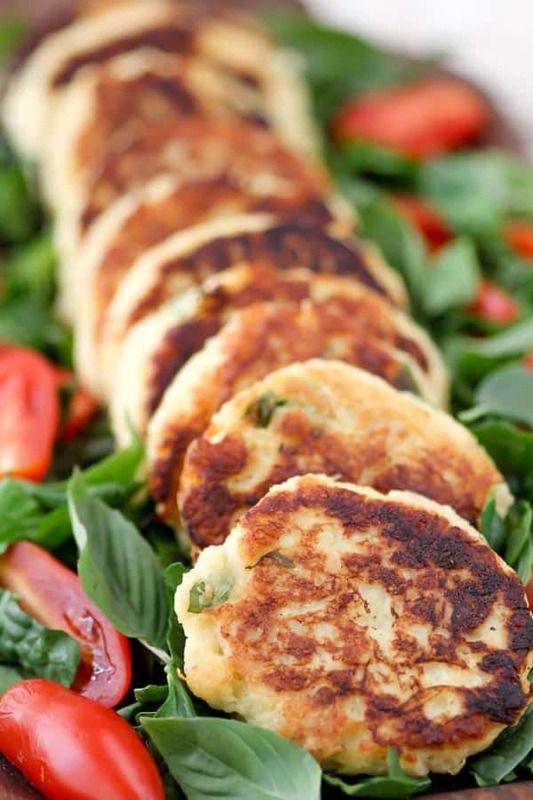 Spaghetti squash, ricotta, Parmesan and fresh herbs formed into fritters and sauteed until golden brown. When paired with warmed marinara, they’re reminiscent of lasagna. Delizioso! Preheat oven to 425°F. Cut the squash in half lengthwise and scoop out the seeds. Drizzle the squash flesh with 2 tablespoons olive oil and season with salt and pepper. Place cut side down on a parchment-lined baking sheet. Roast until squash is tender when pierced with a fork or knife, about 45 minutes to 1 hour, depending on the size of your squash. When cool enough to handle, gently scrape the flesh of squash out with a fork, removing the squash in long strands. Reserve 2 cups for this recipe and save the rest for another meal. In a large mixing bowl, combine the 2 cups spaghetti squash, ricotta, Parmesan, lemon zest, herbs, garlic, salt, pepper, egg, flour and panko. Stir until the mixture is well-combined – it should be thick and creamy. Set a large, heavy-bottomed skillet over medium heat. When hot, add 2 tablespoons olive oil. Once the oil is hot, scoop heaping tablespoonfuls of the batter into the pan. Cook until golden brown, 3-5 minutes, then flip and cook until golden brown on the other side and cooked through, another 3-5 minutes. Be careful that your pan is not too hot or the fritters will cook too quickly on the outside and scorch before the center is cooked. Serve immediately along with warmed marinara sauce. To make these gluten-free, substitute the all-purpose flour for the same amount of gluten-free all-purpose flour. I used Cup4Cup brand gluten-free flour. The panko can be swapped out for crushed Rice Chex cereal. I love fritters and these look like perfection! I love the italian twist! Yum! 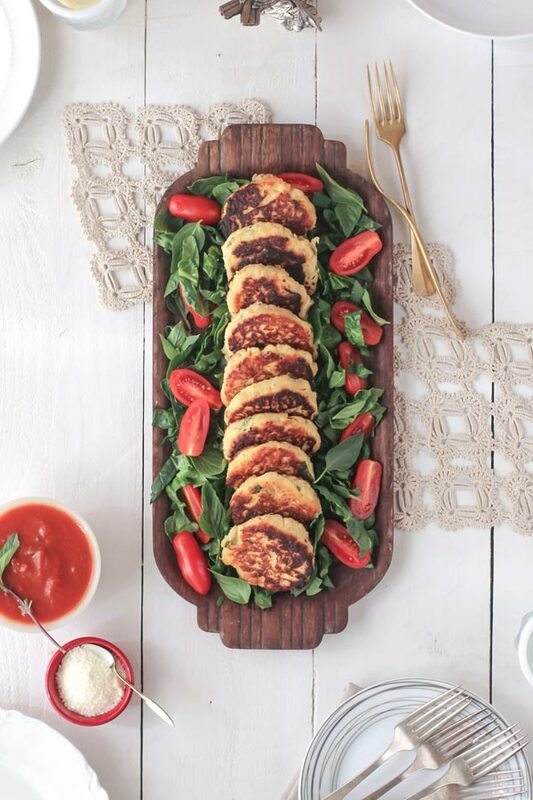 I love spaghetti squash but never ever considered turning it into fritters! It just so happens I’ve got a nice big one sitting on my kitchen counter right now, so I know what this weekend’s project will be! Thanks for the recipe! Yum! I might have to try this. Thanks for sharing. These look absolutely perfect! I love spaghetti squash and need to make these very soon!! I’ve become a bit squash-obsessed in the past few weeks and these fritters are definitely calling to me. I bet they would be awesome mixed into a big ole fall inspired salad! These were so amazing!! I had them with some zucchini spaghetti, what a great combination!! Can you bake these? What temp/time would you recommend? Could these be cooked in a waffle iron instead?